Our properties are very reasonably priced, welcoming, warm, spacious, comfortable and in a wonderful setting. The buildings have a delightful, old-fashioned charm and we have many regular visitors. We must point out, however, that we are not a 5* hotel, and we keep chickens, goats, horses and sheep in farm buildings nearby. Chris has renovated all the buildings almost singlehanded, and it is our aim to live as sustainable a lifestyle as is possible, minimising our carbon emissions and avoiding the worst of modern materialism. We have our own water supply, treated and regularly tested; it is so refreshing to drink pure water without any taste of chlorine and it makes a really good cup of tea! We don’t buy replacements when items can be mended (Chris is fantastic at fixing things); when replacements are necessary we try to find ones that are recycled or at least sustainably resourced. We use environmentally friendly cleaning products, 100% recycled kitchen and toilet rolls and mostly low energy light bulbs. We dry bed linen outside whenever possible and don’t iron it. Apart from the Barn all heating is from renewable resources. 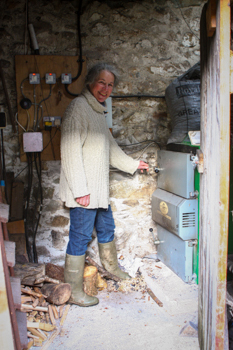 Hot water for both the Shippen and the Hemphouse is provided by our log boiler, and the Shippen now boasts a newly-installed, highly efficient wood burner. The Barn does have a large log burning stove (lovely to sit by!) but is also reliant on an oil-fired boiler. We are looking into renewable alternatives to this. Our most recent barn conversion, the Hemphouse, has been renovated in such a way as to minimise carbon emissions in both the renovation work and the day-to-day running of the property: hemp insulated walls; hemp & lime plaster; tri-iso and pavaflex wood fibre insulation in the roof; LED lighting throughout. Chris now optimises the use of ‘waste’ from our log supplier: he has put an electric motor on an old chaff cutter to chop this brushwood which would otherwise just be put on a bonfire. This then provides fuel for our log boiler. Only a small amount of electricity is used in relation to the amount of fuel produced. He has also made a methane digester for capturing methane gas (from our septic tank) that we use for our own cooking. We would like to install a larger commercially produced unit to provide gas for use in The Barn. We like to promote the use of sustainable energy and if visitors express an interest we enjoy talking to them about this, or indeed anything else! Member of 10:10 – We have easily met the 10% cut in carbon emissions by having photovoltaic cells for electricity and a log boiler to replace our previous oil one. We have had solar thermal tubes producing hot water on our home for many years. 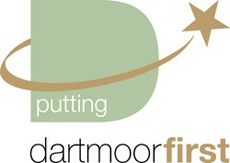 Dartmoor First award – Awarded for installing a log fired central heating system to heat three of our properties (and showing this to any visitor who is interested), and committing to using environmentally friendly cleaning products. 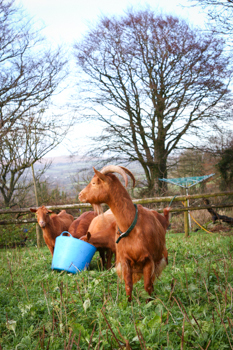 From our Golden Guernsey goats (a beautiful and friendly rare breed) we produce milk, yogurt, cheese and meat. The legalities of selling to the public are too onerous so not for sale, but visitors are welcome to watch the hand milking and bottle feed kid goats if there are any. We have a few Icelandic sheep and Ruth is learning to spin their fleeces. Our hens are an inbred mixture and several of them live a free range existence wandering around the place. Occasionally we have some spare eggs and two or three times a year a hen will emerge with a clutch of chicks. We have two old horses: a quarter horse & a quarter horse cross. We also have a young Dales mare for riding and soon to be trained to harrow our fields. Visitors are welcome to meet them. Occasionally visitors bring horses with them so do contact us if you wish to discuss this possibility. Adjacent to the Barn garden is an area for growing vegetables. 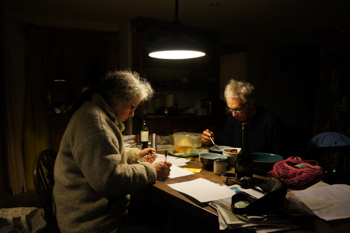 Since retirement Ruth has managed to increase our production making us mostly self sufficient.